I thought they were never too young to start. I guess I was wrong. She wanted a card. I wonder if I can get a honorary membership. Last edited by wanders; 02-06-09 at 07:52 PM. 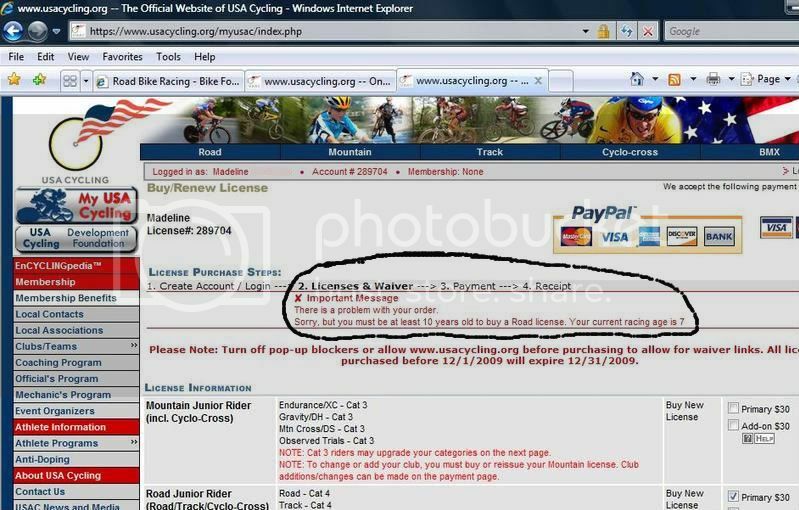 Yeah, explaining purchasing a racing license for a 7 year old would be easier for them to understand than the Missus. I think I'll just contribute to their youth program instead. One of my teams had a 7 year-old on the team after I left. He rode a lot with his older brother and dad, so he had decent riding skills. They just bought citizen's licenses and said he was 10.
make sure he overtrains and burns out by the age of 14. Wait, is your wife 7? he does live south of the mason dixon. srsly... USCF doesn't allow racing under age 10. that's why you see the one-lap kiddie races with free entry for the under 10 crowd. I wouldn't allow her to race either. She found my license and when I told her what it was, she said she wanted one. I could have just bumped her age up to get the "card" issued, but I thought "racing age of 7 in 09" would look good. If it had 10 on it, I could hear it now. "That's not RIGHT!" With the 'racing age' B.S. on the license she should qualify for something next year. Heck, I halfway expect to se 15 yearolds in Masters soon enough. I know what it's like having the kiddies wanting what daddy has. My daughter wanted something to ride her bike on when I was on the trainer. Went into the garage, built up a frame to support the training wheels(she's only 2) and will finish the front block tomorrow. She loves bikes more than I do. She will just ride away for a good 30 minutes before she gets bored. Aren't kids wonderful!! Courtesy photo if you get the chance of your training wheeled trainer setup. I was looking to do that for my 3yo.